The Civic Media: Collaborative Design Studio, based at MIT and working in collaboration with partners in multiple locations, generates civic media projects that are grounded in real-world community needs. In the course, we partner with community-based organizations, and use co-design and lean startup methods for project ideation, design, prototyping, testing, launch, and stewardship. The Co-Design Studio is led by Professor Sasha Costanza-Chock in the Comparative Media Studies Program. My responsibilities as a teaching assistant included recruiting community partners, managing relationships with organizations and students, curriculum design support, organizing design events, and grading. 1) Zumix, a youth organization that aims to serve the diverse, predominantly low-income East Boston neighborhood through the cultivation of artistic expression. This team worked together to increase the visibility of ZUMIX Radio (youth run station) by designing and building a 3D, laser cut, giant flying Z streaming radio. 2) Urbano Project empowers teens to create artwork that engages their communities on issues of social change. This team designed and built PARTI (participatory artistic travelling installation), a mobile installation in a suitcase that travels between different community sites with the Urbano team sharing information about the organization and current student work. 3) City Life/Vida Urbana has supported tenant organizing to preserve housing affordability and resist displacement since their inception in the 1970s. This team developed a series of carnival games to focus on CLVU’s three ongoing campaigns, which fight eviction foreclosures, resist gentrification, and shed light on real estate investors who are turning a profit on foreclosed homes. 4) The Brazilian Immigrant Center (BIC) primarily aims to support the Brazilian and Latino/a immigrant communities in the greater Boston area. Together with BIC, REV, and a team from NuLawLab , this team developed a hotline with health and safety advice for domestic workers through a telephone talk show. 1) The Electronic Frontier Foundation team developed a Surveillance Self-Defense Guide. 2) The American Civil Liberties Union of MA and the Gaurdian Project worked with students to develop the Spidey App, an Andriod-based Stringray detector. 3) Transition House and the Tor Project team built a research portal for domestic violence advocates to better understand how technology (such as device surveillance) is used in Intimate Partner Violence (IPV). 4) The Urban Youth Collaborative group created an SMS survey system to gather data about students and their experiences of surveillance and police abuse inside NYC high schools. 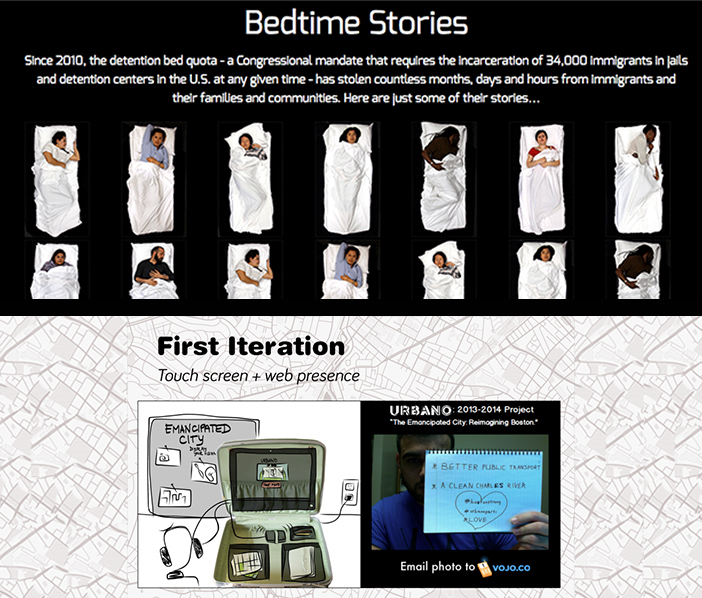 5) SoMove (the Social Movements Oral History Tour) collaborated with students to build the Infiltrated project, which is a web-based documentary that increases awareness of about discussion about cases of infiltration by federal agents within social movement organizations in the U.S.
6) The Detention Watch Network team developed Bedtime Stories, an interactive documentary microsite that raises awareness about the injustices of the U.S. immigration detention and deportation system by focusing on the bed quota. The full case study can be found here. Introduced in 2010, the quota is a congressional mandate that requires the incarceration of approximately 34,000 immigrants in jails and detention centers in the U.S. at any given time.